The MegaShift™ automatic transmission controller code is full-featured code (see features below) designed for the GPIO board from Bowling and Grippo. MegaShift™ (aka. "MShift™") is designed as a 'universal' flexible DIY automatic transmission controller, adaptable to many electronically controlled transmissions. MegaShift™ with the GPIO board has been in use since early 2006 in testing in a variety of vehicles, and has been in production since the Fall of 2009. The GPIO board was designed with transmission control in mind - it is not a 'hacked' engine controller with inherent compromises and limitations. It also costs significantly less than a MicroSquirt® controller or a complete MS-II® controller. 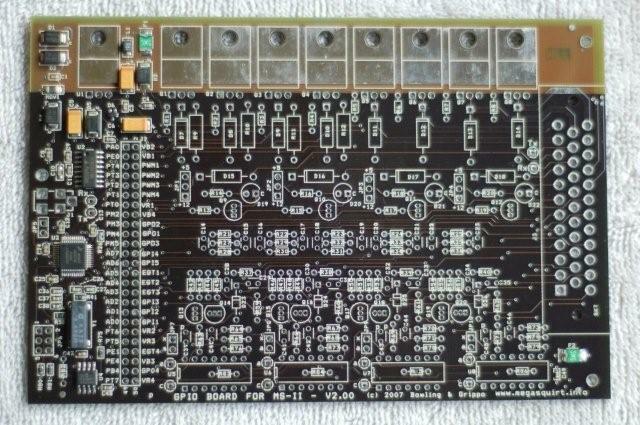 You can buy the GPIO board right now from DIYAutoTune (the MShift™ code is free to download). Applications include the 4L60E and 4L80E 4-speed overdrive transmissions from General Motors (the defaults are for the 4L60E), Chrysler 41te, as well as many other similar electronically controlled automatic transmissions. Full datalogging of speed, gear, odometer, line pressure, instantaneous fuel efficiency, converter slip, etc., etc. Provisions for 'paddle' up and down shifter buttons on steering wheel with 'Shift Button Duration' for user settable sensitivity (debounce). The buttons can be separate grounding switches, or a variable voltage signal (that may be adaptable to your horn set-up). User settable ignition timing retard for the duration of a shift (to lessen drive line shock, or chance of wheel spin, etc.). The LEDs or LCD display can be set to flash in reverse. TunerStudioMS display of shift button status, braking, gear, TCC status, speed, load, odometer, trans temperature, etc. GM (3 digital inputs) or Ford style (varying voltage) shift lever determination. If the Ford style is used, the 2 inputs not used for shift lever position determination can be used for datalogging voltage signals (temperatures, TPS, MAP, etc. ), OR one or both of them can be used as shift solenoids. The MegaShift™ controller code (for the GPIO hardware) uses the CAN (controller area network) to communicate with MegaSquirt-II™ controllers to get get the current load, battery voltage and engine rpm (and other variables you might want to add to the code). It also allows you to use a laptop connected to the MS-II™ to configure, monitor, and datalog the MShift™ controller. However, the CAN communications can be disabled for stand-alone use of MShift™ on a GPIO board with the load determined from a throttle position sensor (TPS), Manifold Absolute Pressure (MAP) sensor or Manifold Air Flow (MAF) sensor (though the user loses the over/under rev protection and the battery voltage PWM adjustments). When CAN is used, this load channel is available to view and log any 0-5 Volt signal (or higher, with an appropriate voltage divider circuit made up of two resistors and a Zener diode) in TunerStudioMS. The line pressure channel is also available for datalogging if not used for the recommended line pressure sensor. dropping in speed to under 8 mph (from over 20 mph) without selecting first gear in 2WD mode. shifting to any of Park, Neutral, or Reverse gears. Gear is selected according to a 16x9 (speed X load) shift table which selects the target gear based on the current vehicle speed and load (the lookup table is user configurable). Load is based on an average (the period of the averaging is user-settable) of the instantaneous load (load is not sampled while braking). Revert to auto-mode at any time by pressing both shift buttons simultaneously. the trans fluid temperature is above a user specified minimum. TCC engagement is forced if the transmission fluid temperature is too high (above a user specified temperature), regardless of load. Note that the GPIO with the MegaShift™ code only controls the forward gears. You will still require a mechanical shifter to place the transmission into Park, Reverse, or Neutral. The manual shift lever also indicates the maximum gear the controller ought to select - for example, if the shift lever is in second, the transmission controller will limit the transmission to first and second gear only. The transmission's fluid temperature is sensed by the transmissions internal temperature sensor (the default is 4L60E's GM sensor, but other sensors can be used). A timer channel is used to get the vehicle speed from the VSS sensor on the output shaft, and the TunerStudioMS interface has both a speedometer and an odometer (configurable in miles or kilometers). GPIO boards from Bowling and Grippo are now available from DIYAutoTune, as well as other MegaSquirt® vendors. © 2004, 2015 Bruce Bowling and Al Grippo. All rights reserved. MegaSquirt® and MicroSquirt® are registered trademarks. This document is solely for the support of MegaSquirt® boards from Bowling and Grippo.